from the St Patricks DayBut they have many categories to choose from like Cool T-Shirts, Girl's T-Shirts, Novelty T-Shirt's and more. This shirt retails for $ 16.99 but on sale for $15.29. This shirt is really cute and material is very soft. I love the feeling. These are great for males and females. For the Giveaway 1 Lucky winner will win a $15 dollar gift card to CrazyDog T-shirts via Email and will be issued through crazydogtshirts.com. You can not have received a promotional offer within the past 90 days, or own a review/giveaway blog of there own. Disclaimer these are my honest opinion about this product I was not paid for my opinion. 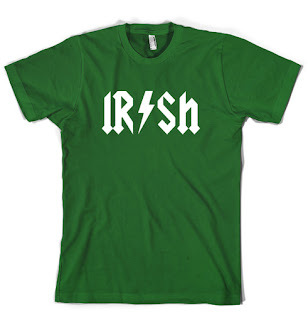 I would also get an "Irish" shirt since me and my hubby are both Irish :) great giveaway!! Not sure why my comment is not here from the other day. I would choose the Hot Mess kids shirt!